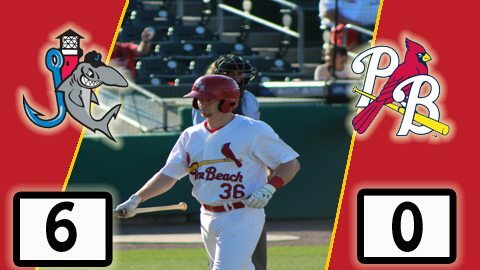 The Palm Beach Cardinals have struggled over the course of the past week and a half, entering Saturday with a record of 14-15 and 4-6 in their last 10 games. While that doesn’t signify a terrible situation, it still places them at the bottom of the standings in the Florida State League’s Southern Division. On Saturday, they faced off once again against the Jupiter Hammerheads at Roger Dean Stadium. 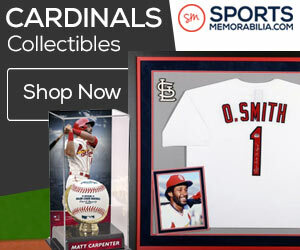 Jack Flaherty got the start for the Cardinals, and ended up pitching his longest game of the 2016 season by going six innings, giving up six hits, four earned runs, four walks, and four strike outs on the afternoon. Jorgan Cavanerio started for the Hammerheads, and was one of four pitchers to contribute to the cause of no-hitting Palm Beach for the first time in their history (Palm Beach has been a franchise since the 2003 season). The scoring began in the top of the fourth inning. Justin Bohn started the inning off with a double, and soon after got tagged out on a fielder’s choice to the shortstop. Next up for Jupiter was Taylor Ard, who was issued a walk, followed by a fly-out. Flaherty walked the following two batters, thus loading the bases. Another walk to Brian Schales would result in the first run scoring. Yuniel Ramirez singled to center to drive in two more and make it a 3-0 game. Cardinals manager Oliver Marmol later got ejected, as he tried his best to spark some life into the team. The Hammerheads then scored two more runs in the ninth. Michael Heesch entered the game for the Cardinals, and wound up loading the bases, with no one out. He then would give up two runs thanks to a sacrifice fly towards left field and a ground out to the shortstop. Despite the fact that they had a runner on second thanks to a walk and a stolen base, Palm Beach came up empty in the bottom of the ninth, losing 6-0 on the evening, and dropping to 14-16 in the process. Sunday afternoon will feature Austin Gomber and Chris Pike as the game’s starters, as Palm Beach looks to snap their seven game losing streak.